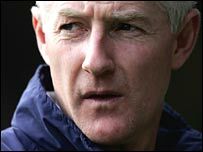 Leicester have appointed Nigel Worthington as their manager until the end of the season after sacking Rob Kelly earlier on Wednesday. The club's 3-0 defeat by Plymouth on Bank Holiday Monday was the final straw which ended Kelly's reign at the helm. The result left The Foxes without a win in eight matches and just five points above the relegation zone. Worthington was axed by Norwich in October and will face his former team at the Walkers Stadium on Saturday. He has been placed in temporary charge until the end of the season by the Foxes' new owner Milan Mandaric. "Indifferent results and continuing under-achievement on the field has left me with no alternative but to address the situation," said Mandaric. "This is a decision I have not taken lightly and it has been the cause of endless sleepless nights recently. "I have the utmost respect for Rob and his team and the tremendous job he has done in increasingly difficult circumstances over the last 14 months. "However, the lacklustre and uninspired performance at Plymouth on Easter Monday has drawn me to the conclusion I have to act now. "I have given Rob and his coaching team undivided loyalty and support since I assumed control of this club two months ago but unfortunately it has not worked. "I want to make one thing perfectly clear to the tremendous supporters of this football club, who have backed the team unconditionally despite the recent run of unacceptable results and performances. "I will not allow them to suffer in silence and as the owner and chairman of this club I have a direct responsibility to safeguard the future of Leicester City and take the appropriate action to ensure that happens. "I have taken a decision to appoint Nigel Worthington as temporary caretaker manager with immediate effect and Nigel will be joined by Doug Livermore as his assistant. "They have agreed to take charge for the remaining five games of the season at which time I will review and address the managerial situation." Should City sack Rob Kelly?